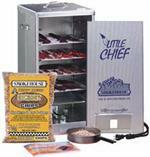 The Front Load style of the Little Chief electric food smoker allows for easy access to each smoking rack. Great for smoking fish! Complete Top Load food smoker, smokes 50 pounds of meat at once. 25 pound capacity, complete smoker kit includes everything you need. Mini Chiefs compact size is perfect when traveling in a camper, RV or motor home, or just for other uses where the small size is all you really need.